Summer holidays having officially started the number of properly watchable films at the cinema has quadrupled and as a family we have been finding ourselves more and more often at the only really accessible cinema in Leeds - the Vue Cinema in Kirkstall. It being the summer holidays going to the cinema means more than just going to the cinema; it means spending as much time out of the house as possible so whiney foster brother is less whiney. 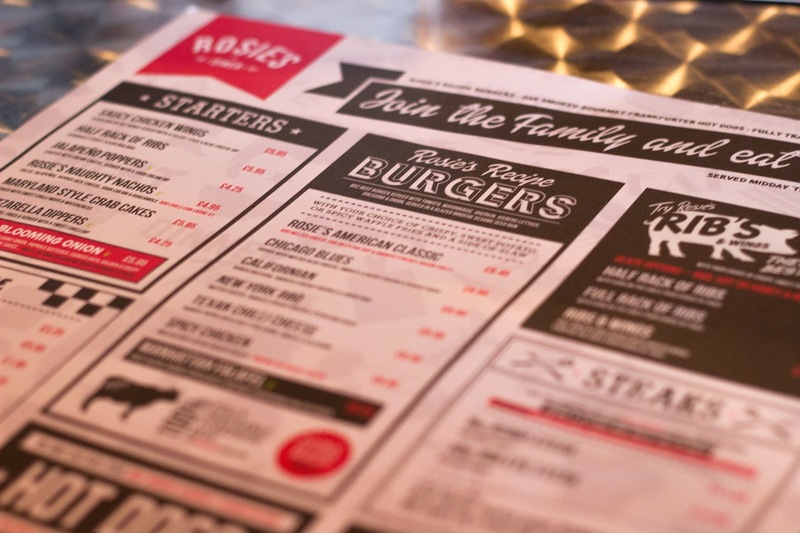 Officially, whiney foster brothers summer holidays started early as he finished school when he finished his exams so the trip to Rosie's I am reviewing is actually the second trip of the summer holidays....so far. I am obsessed with Americana food and watch 'Diners, Drive-ins and Dives' almost religiously. 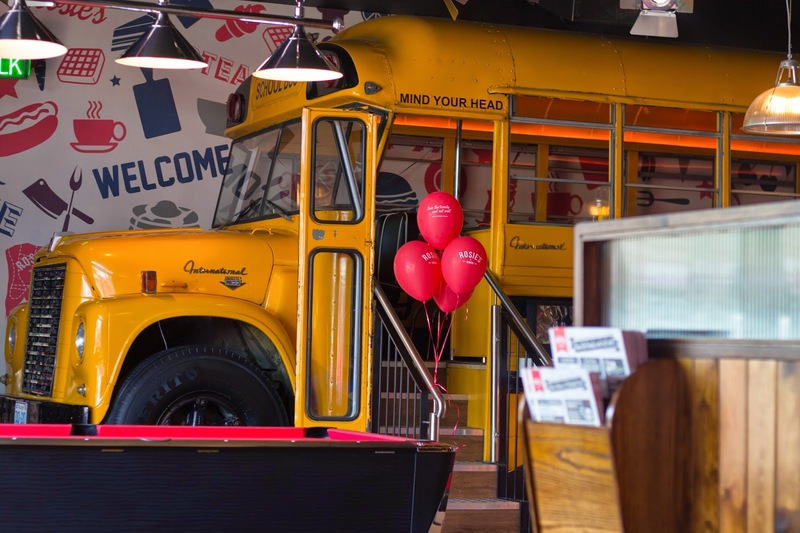 Rosie's Diner reminds me very much of things I have seen on 'triple D' ; some of the seating is in a big American school bus, all the food is slightly extreme, and you know...its an American style diner. There are booths (along with two or three tables) for additional seating & this is all charmingly Americana, looking a little like a 50's theme restaurant. 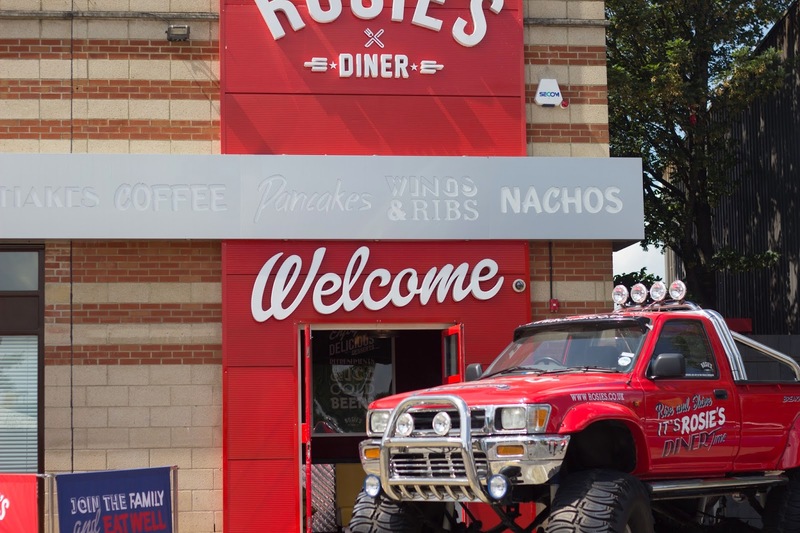 The menu is very 'meat' based, although there are the occasional vegetarian options I'm not sure you'd pick Rosie's if your whole family were veggie - my brother spent most of the decision making process trying to decided between a full rack of ribs & an (I think) 14oz steak. 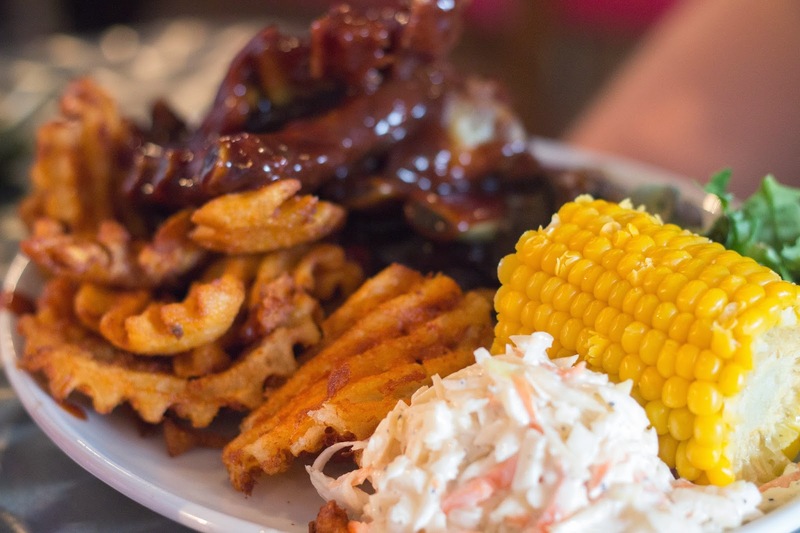 I have to say, outside of burgers & hot dogs there really isn't a lot of choice...ribs, steaks, fried chicken & that's basically it... Not that that's necessarily a problem if all those options were really good. 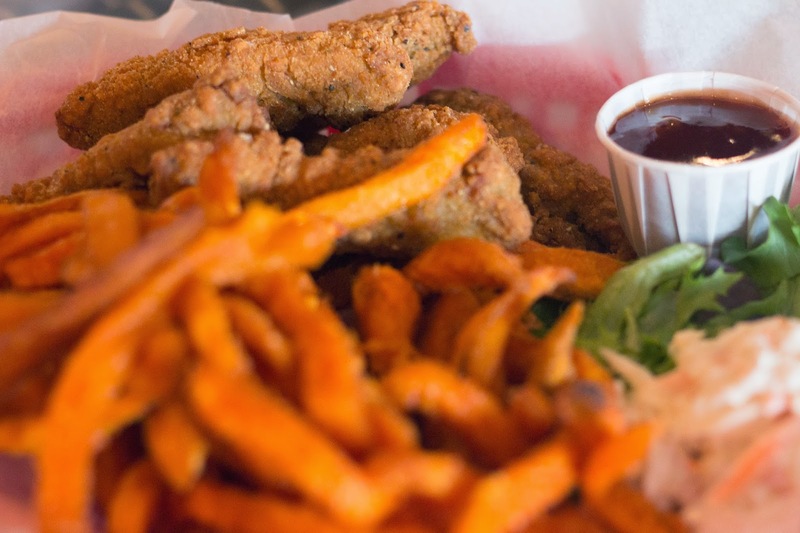 I got the fried chicken with sweet potato chips, which are two of my favourite savouries ever...especially sweet potato chips. ^^ The sweet potato chips are good, soft but with tasty crisp bits on the edges & a good amount of bite. The fried chicken though was a real disappointment. Maybe I'm a fried chicken snob, my fried chicken recipe is one of the best things I've ever come up with & you ask anyone who's tried it, it is something pretty special even though I've not yet perfected the crunch. This fried chicken had a great crunchy outside, probably cornmeal or something, but was overpoweringly peppery. I had to leave most of it because it was just....hard work to eat. Even with the coleslaw & bbq sauce that came on the side, all you could taste was the pepper. This could have been a bad batch but, I won't be ordering it again. Which is disappointing because I honestly don't always want a burger or a hot dog & am not a rib kind of person. My brother ordered the full rack or ribs & spicy waffle fries. He is a total rib nut, whenever he goes to town with his friends he goes to the same place & orders ribs (which is partially because he loves ribs & partially because his friends are vegetarian & he thinks it's really funny). He likes his ribs meaty & chewy so the fact that the meat was falling off the bone of these ribs disappointed him a little bit. Not that it stopped him eating them all, just that he would have liked to feel a little bit more like a carnivore. The waffle fries are crispy & not super spicy, just flavourful. Or so I hear. I've yet to be allowed to nab one off anyone's plate. My mum & foster brother both ordered burgers. 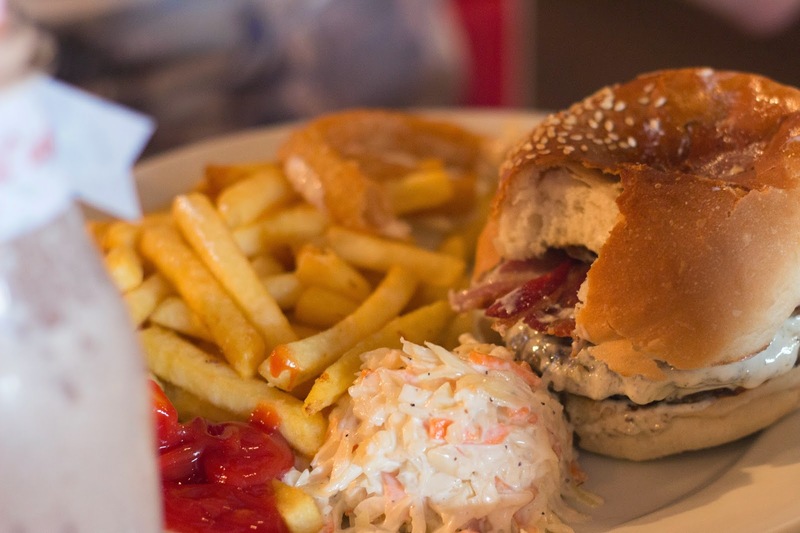 My mum a plain burger & my foster brother a Californian which comes with bacon, onion rings & some kind of creamy sauce. 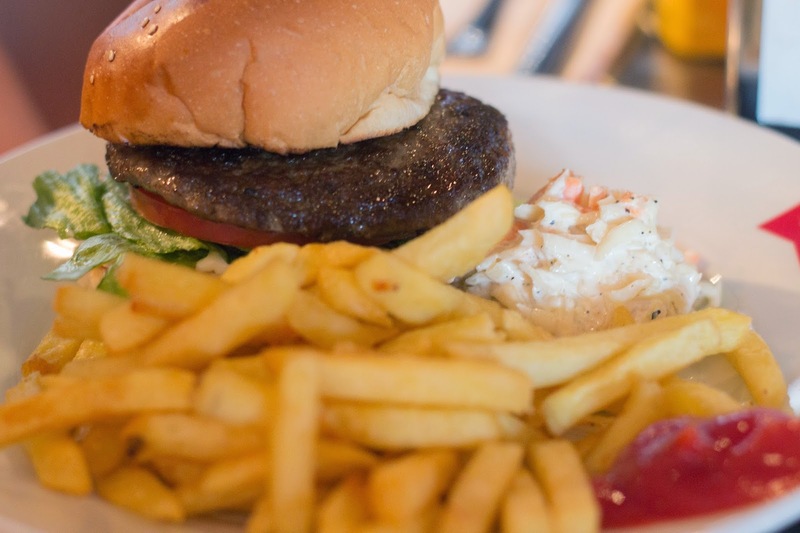 My mum says the burgers are nice, a good size & easily as nice as other places that sell burgers but don't specialise in them e.g. Frankie & Benny's. One of the things that made this a second visit was the milkshakes. I didn't have one last time & had been really looking forward to them. They come in old-fashioned milk bottles & look adorable. They aren't the best milkshakes (although I will admit that I really am a milkshake snob) but they are tasty & a lot of fun. The bit that made coming back an imperative for me was the desert menu. I have said that I love Americana food & more than anything else I love Americana deserts. Sit me down with a desert that contains pumpkin or pecans or sweet potatoes or bourbon or a combination & I will eat it until there is no more. 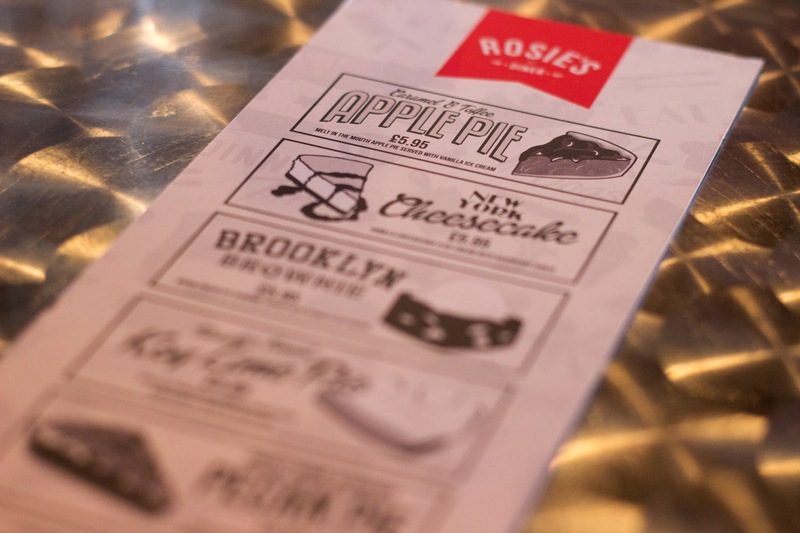 The desert menu at Rosie's Diner is split into sundaes on one side &...things that come in slices on the other (in addition to pancakes/waffles with ice-cream). Sundaes include everything from a birthday cake sundae with popping candy & cake - that you get free if you can prove it's your birthday - all the way through to the Strawberry Cheesecake Sundae which (from the brief glimpse I got as my brother ate it) seems to contain no ice-cream at all, just crumbled up cheesecake, cream from a can, strawberries & strawberry syrup. 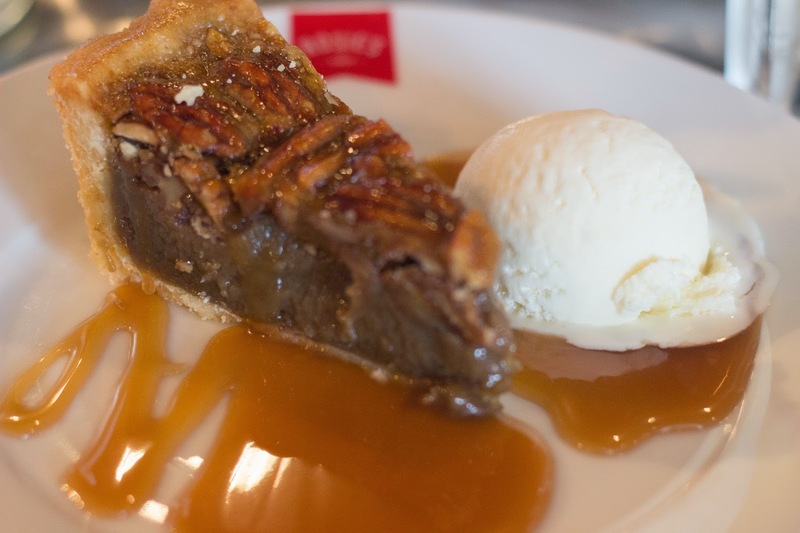 I got the pecan pie which contained bourbon & was drizzled with caramel. The caramel was over kill & the pie comes in tiny slices but boy is it good! I LOVE pecan pie but I'm pretty much the only one in my house who does so it's not made very often & the odd time you can find it in shops...it's not really very good. This one is delicious with enough bourbon buzz that you can taste it without tasting the alcohol at all. I said I'd come back to access. 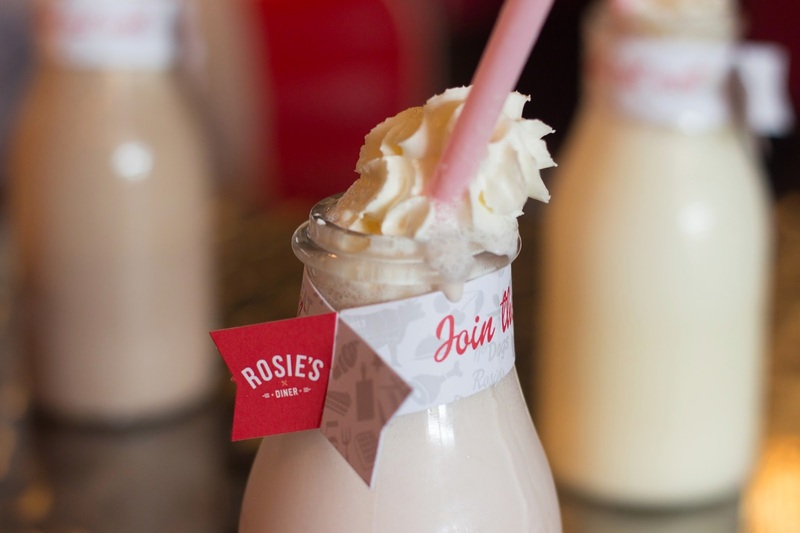 The only catch with Rosie's, to my mind, is that the wheelchair loo is teeny-tiny. Seriously, I don't usually need my mum's help in the bathroom but when I go to Rosie's I need her to help me get in & out of the chair & navigate it out because the bathroom is so tiny. I really don't know how people with no mobility manage, I'm pretty sure it would be impossible. P.P.S. I probably won't be doing video content for the foreseeable future. The energy expended in filming & editing is just getting too much for me. It looks like such a cool place, that bus!!! I'm so glad you could go there, I know how horrible restaurants can be. I'm so sorry to hear you won't be making videos for a while, that is such a shame but I can imagine just how much energy goes into filming and editing. Fingers crossed you'll be feeling up to making more once your body stops being a b**** to you! Everything look so so good!! I do love a good American diner. Nom nom nom give me pecan pie!